List astronomical phenomena that the Tychonic world system accounts for automatically but that the Ptolemaic system does not. Explain how the Tychonic system accounts for the phenomena. system differed from Ptolemy's was in placing Mercury, Venus, Mars, Jupiter, and Saturn in circular orbits centered on the Sun rather than on the Earth. In departing from the ancients and placing the planets in orbits centered on the Sun, Tycho gained many of the geometric advantages of the Copernican system without displacing the Earth from the center of the universe, nor placing it in motion. The motions of the Sun and planets relative to the Earth are mathematically and observationally equivalent in the Tychonic and Copernican models. Both systems would accommodate the phases of Venus, after they were observed by Galileo. Tycho's system became a popular alternative for astronomers forced to give up the Ptolemaic system but not ready to accept the Copernican system. They don't seem to have been bothered by, or even to have been aware of, the narrowed distinction between the Sun and the planets and the diminished status of the Sun in Tycho's system. Figure 16.5: The Tychonic, Copernican, and Ptolemaic Systems Compared. Giambattista Riccioli was a Jesuit and thus prohibited from teaching the Copernican system. 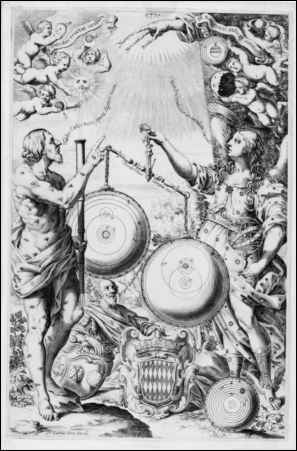 In the frontispiece of his 1651 Almagestum novum (New Almagest), Astrea, the Goddess of justice, is the winged angel holding the balance beam of truth. The intermediate Tychonic system outweighs the Copernican heliocentric system. The Ptolemaic geocentric system, found wanting in the balance, is discarded in the lower right corner. Courtesy Copenhagen University Library. funding. After a brief stop in Copenhagen, presumably to give Christian a last chance to retain him for the glory of Denmark, Tycho sailed away with his instruments, printing press, and two dozen household servants in search of a new patron. After two years of wandering, Tycho found favor with Emperor Rudolph II of the Holy Roman Empire. Tycho set up his instruments in a castle near Prague. He died there two years later. Legend has it that Tycho died from uremia due to a ruptured bladder after too large a meal. According to a note written in Tycho's observation logbook by an assistant, on October 13, 1601, Tycho drank a bit overgenerously at a banquet, felt some pressure on his bladder, but remained seated rather than commit a breach of etiquette. By the time he reached home he could no longer urinate. There followed excruciating pain, insomnia, and delirium before Tycho died on October 24. He may have had an enlarged prostate, although he wasn't all that old. A kidney stone is another possibility, but none were found when Tycho's body was exhumed in 1901. A more recent examination, in 1996, of strands of Tycho's beard found increased levels of mercury. This might be explained by exposure to mercury in his alchemical laboratory while trying to make gold. One of the hairs, however, seemingly had a high local concentration of mercury in the root, suggesting that Tycho ingested the mercury during the last day of his life. If so, did he take it as medicine or by mistake, or was he poisoned? Johannes Kepler succeeded Tycho as Imperial Mathematician at the Prague court. Kepler was born in southern Germany in 1571, into what has been described as a family of impoverished, degenerate psychopaths. His father deserted the family early on, and his mother later was tried as a witch. Kepler would not have received an education had not the Dukes of Württemberg created outstanding Protestant universities to produce government administrators and clergymen to lead the reformation then raging in Germany. There was also a network of elementary and secondary schools, and scholarships for children of the faithful poor. At the University of Tübingen, Kepler received a classical education, including mathematics and astronomy. His professor, Michael Maestlin, was a Copernican, perhaps the only Copernican professor at that time. Kepler seemingly was destined for the clergy, to become a Lutheran minister, and he proceeded to the theological school. In 1593 the mathematician in the Protestant school at Graz, the capital of the Austrian province of Styria, died, and the school sought a recommendation from Tübingen for a replacement. Perhaps the Tübingen professors wanted to be rid of the querulous young Kepler, who had defended Copernicus in a public disputation. Maybe they hoped he would make a better teacher than a priest. 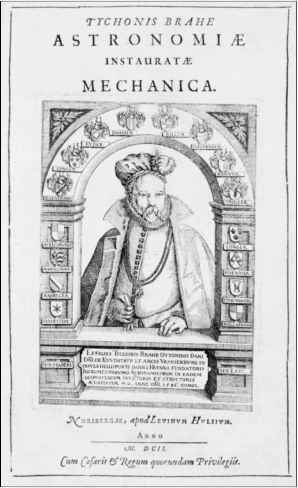 Figure 16.6: Portrait of Tycho Brahe. Frontispiece from Tycho Brahe, Astronomiœ instauratœ mechanica [Instruments for the restoration of astronomy]. Noribergae [Nürnberg]: apud L. Hvlsivm [by Levinus Hulsius], 1602. 107 unnumbered pages, woodcut and engraved illustrations, map, plans. Kepler thought he had discovered a grand design, the cosmic order linking planetary radii with a progression of basic polygons. But then it struck Kepler that there is no natural limit on the number of polygons. He wrote: "I realized, in fact, that if I wanted to continue the arrangement of the figures in this manner, I should never come to the Sun, and that I should never find the reason why there must be six planets [there were then six known planets] rather than twenty or one hundred" (Koyre, Astronomical Revolution, 142). Figure 16.7: Basic Polygons between Circular Orbits. Kepler imagined a mathematical harmony involving planetary radii and polygons. He drew the first basic polygon, an equilateral triangle, with three sides, inside the circle of Saturn's orbit. Next, within this triangle, he drew Jupiter's circular orbit. Remarkably, the ratio between the two circles' radii was the same as that observed between the orbits of Saturn and Jupiter. Then Kepler placed the second basic polygon, a square, with four sides, inside Jupiter's orbit; and he placed Mars's orbit within the square. Then, he placed a pentagon, with five sides, between the orbits of Mars and Earth. Then, he placed a hexagon, with six sides, between the orbits of Earth and Venus, and so forth. The coincidence could not be purely fortuitous, could it? There were six planets, five intervals between them, and five regular solids! Kepler proclaimed the discovery in his Mysterium cosmographicum (Cosmic Mystery) in 1596. Kepler's emphasis on mathematical harmony might have been expected to appeal to Neoplatonists and Neopythagoreans. And his delight in explaining the existence of six planets as the natural and inevitable consequence of theory rather than merely an arbitrary parameter revealed by observation might have been expected to resonate with astronomers sharing Copernicus's philosophical values. Yet Kepler's model of nested polyhedra was not well received. Figure 16.8: The Five Regular Solids. 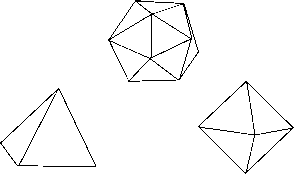 There are five regular (or perfect or Platonic or Pythagorean) solids; no more, no less. All sides are equal, all angles are the same, and all faces are identical. They are the tetrahedron (4 triangular sides), cube (6 square sides), octahedron (8 triangular sides), dodecahedron (12 pentagonal sides), and icosahedron (20 triangular sides). About the Earth's circle Kepler circumscribed a dodecahedron; then around the dodecahedron he drew Mars' circle; then about Mars' circle he circumscribed a tetrahedron; around the tetrahedron he drew Jupiter's circle; about Jupiter's circle he circumscribed a cube; and he enclosed the cube with Saturn's circle. 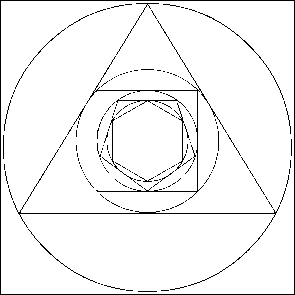 Within the Earth's circle, Kepler inscribed an icosahedron; in it he inscribed Venus' circle; in this circle, he inscribed an octahedron; and he inscribed Mercury's circle inside the octahedron. priori reasoning from theory or principles without prior observations, but a posteriori reasoning from observation to theory was the proper way to determine the sizes of the planets' orbits. Kepler's critic continued: "What does it matter whether or not they coincide with the regular bodies? If he [Kepler] truly thinks that after this kind of principle has been proposed . . . calculations are to be bound to it, I think this is done in preposterous order" (Voelkol, The Composition of Kepler's, 79). Kepler's theory was rightly perceived as a mystical a priori speculation. It had originated more in his imagination than in observation. His order of work was preposterous. The proper procedure decreed for astronomers (however much they believed a priori in uniform circular motion) was to derive the distances of the planets a posteriori from observations, not a priori from the geometry of regular solids. Probably as damning, Kepler had ventured outside the astronomical tradition of saving the phenomena with uniform circular motions, while leaving questions about causes to physicists. Kepler was more a mathematical mystic and a physicist than a geometrical astronomer. He pried into secret principles of nature with physical or metaphysical reasons. Years later, in 1616, Maestlin would write to Kepler: "Concerning the motion of the Moon you write you have traced all the inequalities [deviations from uniform circular motion] to physical causes; I do not quite understand this. I think rather that here one should leave physical causes out of account, and should explain astronomical matters only according to astronomical method with the aid of astronomical, not physical, causes and hypotheses. That is, the calculation demands astronomical bases in the field of geometry and arithmetic" (Voelkol, Kepler's Astronomia Nova, 69). Figure 16.9: Kepler's Model of the Solar System; Close-up of the Model. ever to command the attention of astronomers with a convincing and compelling proof. The most important result following from Tycho's receipt of Kepler's Mysterium cosmographicum was a vague invitation to visit Tycho someday (and somewhere, because he was then wandering about Europe in search of a new patron). However nebulous, Tycho's invitation would be particularly welcome after Archduke Ferdinand of Hapsburg decided to cleanse his Austrian provinces of Lutheran heresy. Kepler's school was closed in 1598, and all Lutheran schoolmasters and clergy were ordered to leave in eight days or forfeit their lives. The archduke was pleased with Kepler's discoveries, however, and soon allowed him to return. Still, talk of torturing and burning heretics must have worried Kepler. Tycho was now settled near Prague, a result which Kepler, who could not have afforded a trip to distant Denmark, would later attribute to Divine Providence. By happy chance, one of Emperor Rudolph's councilors was in Graz about to return to Prague, and he agreed to take Kepler with him. Otherwise, Kepler might not have been able to afford even this relatively short trip. They departed for Prague on January 1, 1600. Kepler wanted to test his own theory. Tycho, however, had hired Kepler to test Tycho's theories. 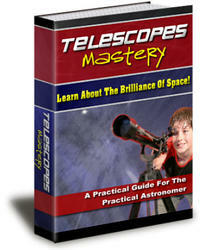 Not trusting Kepler, Tycho only slowly trickled out observations to Kepler, and only for Mars. That Tycho set him to work on Mars's orbit Kepler also attributed to Divine Providence. He wrote: "For Mars alone enables us to penetrate the secrets of astronomy which otherwise would remain forever hidden from us" (Koestler, Sleepwalkers, 315). The motions ofthe other planets are so close to circular that even Tycho's data would not have revealed their noncircularity. Mars's orbit alone deviates sufficiently from a circle that Tycho's observations would force Kepler from an eccentric circle to an oval and eventually to an ellipse. Figure 16.10: Stars. 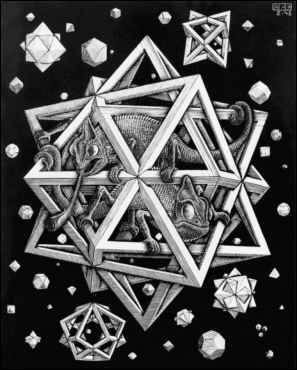 Engraving by M. C. Escher, 1948. © 2005 The M.C. Escher Company-Holland. All rights reserved. www.mcescher.com. out by means of a single, simple magnetic force. Moreover he would demonstrate this physical conception through calculation and geometry. Kepler seems to have thought that the force emanating from the Sun driving the planets was analogous to magnetism, or even magnetism itself. William Gilbert, royal physician to both Elizabeth I and James I in England, had published De magnete, his study of the magnet and magnetic bodies and that great magnet the Earth, in 1600. The first result of Kepler's obsession with physical cause was that he made his calculations with the center of Mars's orbit not at the center of the Earth's orbit but at the Sun. A mathematical point, Kepler reasoned could not move and attract a heavy object. The Sun, he believed, was the physical center and cause of the planets' motions. 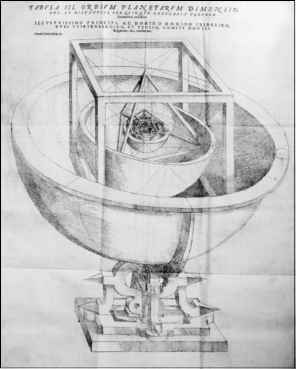 Centering Mars's orbit on the Sun also better fit observations, but Kepler's initial motivation was more philosophical. Justification of a scientific theory relies on reason, while discovery often is a product of human emotion. Kepler's obsession with physical cause also discouraged him from employing implausible nonphysical devices such as epicycles and equants (but eccentric circles were acceptable) in his many attempts to fit an orbit for Mars to Tycho's data. Tycho's sudden death in 1601 liberated Kepler to pursue his own interests. Tycho's death also left Kepler with the data he coveted. 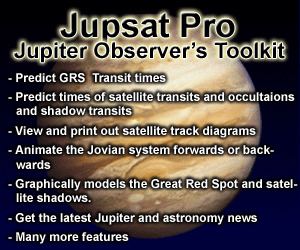 Previous astronomers had observed the planets only at critical moments, such as opposition. In contrast, Tycho's more omnivorous observing program caught the planets at more points in their orbits. When Kepler posed new questions, Tycho's data would sometimes yield an answer. To a correspondent, Kepler confessed that he had quickly taken advantage of the absence of Tycho's heirs and taken Tycho's observations under his care, perhaps even usurping them. Kepler still had to deal with conventional astronomers' criticisms. There is more to the advance of science than new observations and new theories. Ultimately, people must be persuaded. Kepler's Astronomia nova (New Astronomy) of 1609 is not the stream-of-consciousness narrative, the aimless wandering full of failures and excursions up blind alleys in his "war on Mars" that it appears to be. Rather, the book is a cleverly composed argument. Kepler had learned well his lesson from the negative reception given his Mysterium cosmographicum. If astronomers wanted a posteriori, he'd give them a posteriori—or at least what looked like it. The title page of his Astronomia nova read "A NEW ASTRONOMY Based on Causation or A PHYSICS OF THE SKY, derived from Investigations of THE MOTIONS OF THE STAR MARS, Founded on Observations of the Noble TYCHO BRAHE." First, Kepler feigned a good faith effort to find a theory in the classical form of uniform circular motions. He investigated Mars's orbit "in imitation of the ancients." He failed, and in failing, he convinced his readers that the problem was intractable. Only then did he ostensibly look to physical cause as the only approach that could succeed: "After trying many different approaches to the reform of astronomical calculations, some well trodden by the ancients and others constructed in emulation of them and by their example, none other could succeed than the one founded upon the motions' physical causes themselves" (Voelkol, Kepler's Astronomia Nova, 225). Kepler tried an oval orbit. Discrepancies between Tycho's observations and circular and oval orbits were equal and opposite. An elliptical orbit fit in between the circular and the oval. Thus what would become known as Kepler's first law: the planets move in elliptical orbits with the Sun at one focus. Kepler had expected to solve the problem of the orbit of Mars in a few weeks; instead, the solution consumed six years of intense labor.